Hold up your right hand with the palm facing you, and squish your fingers close together. Now imagine trying to hold a basketball in that clenched hand. Hard to imagine, right? Now put up your hand again, and stretch out the fingers as wide as you can. You could even hold a basketball in that hand, right? I learned all about hands dropping/holding basketballs from my first parenting teacher, Rabbanit Talia Helfer, who guided me, week by week, through those overwhelming years when my big kids were little. She explained to us that the hand with the clenched fingers is a person lacking joy, who feels flooded by her responsibilities. And by contrast, the joyful person, fingers stretched wide, has the energy and spark and ability to deal with what the day sends her way. This is, she taught us, our number #1 goal in raising religious children. To raise joyful children with joy–wide-stretched fingers all around. And this, Rabbanit Talia told us, is the reason we invest so much in making exceptionally beautiful, joyful weddings. In order to send the couple off into adulthood and life with a major dose of wide-stretched fingers– prepared to face the challenges life inevitably will send their way. And that’s what I was thinking of at my daughter, Moriah’s, bat mitzvah last night. So much dancing, so much joy, so much excitement…in order to send my dear Moriah off to a lifetime of mitzvot, to the life of a Jewish woman–with all the often overwhelming responsibilities that entails– with a glowing smile, a spring in her step, and, most importantly, fingers stretched wide. Ready to share her unique light with Am Yisrael and the world, IY”H. That’s such an important parenting tip, thank you! And Mazel tov! Beautiful advice. May you only have nachas from her and all of your children! Mazal tov! Mazel tov! 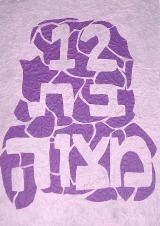 Wishing u much nachas !! !